[18F]fluciclatide, a peptide ligand with high affinity for αvβ3/αvβ5 integrins, is a proposed biomarker of tumor angiogenesis. The study rationale was to perform a preliminary evaluation of the relationship between tumor [18F]fluciclatide uptake and perfusion by [15O]H2O PET. Patients with non-small cell lung cancer and melanoma underwent dynamic imaging with arterial sampling following injection of [15O]H2O and [18F]fluciclatide. Quantification was performed using a one-tissue compartmental model for [15O]H2O and a two-tissue model for [18F]fluciclatide at volume-of-interest level, and SUV at voxel level. Tumor binding potential (k3/k4 ratio) of [18F]fluciclatide tumor was 5.39 ± 1.46, consistent with previous studies in breast cancer metastases. Voxel-by-voxel maps of [18F]fluciclatide delivery strongly correlated with [15O]H2O-based perfusion (p < 10−4 tumor, 1,794 ± 1,331 voxels). Interestingly, this correlation was lost when retention of [18F]fluciclatide at late time-points was compared with perfusion (p > 0.15). Our study suggests tumor [18F]fluciclatide retention is unrelated to tumor perfusion, supporting use of late (60-min) imaging protocols in patients. Tumor angiogenesis is essential for cancer survival . Many novel therapeutics have been developed which aim to target this process by acting as either angiogenesis inhibitors (e.g. by blocking the action of vascular endothelial growth factor) or as vascular disrupting agents, which target the extracellular matrix ,. Despite the recent advances in therapeutics, there remains a paucity of effective biomarkers which can predict the response of tumors in vivo to these treatments. One area of promise is the development of imaging agents that target the αvβ3 and αvβ5 integrins - a set of transmembrane proteins essential for maintaining the relationship between the cell and the extracellular matrix and that have been found to be upregulated on tumor vascular neoendothelium ,. [18F]fluciclatide is an arginine-glycine-aspartic acid (RGD) peptide which binds the αvβ3 and αvβ5 integrins with high affinity . We have previously studied the dosimetry and biodistribution of this compound labelled with F-18 in healthy volunteers with positron emission tomography (PET)  and the uptake profile of the tracer in patients with metastatic breast cancer . The latter study showed significantly higher radiotracer uptake in lung metastases from breast cancer compared to normal lung tissue. [18F]galacto-RGD is a similar promising agent for studying integrin-related angiogenesis developed by Wester's group , and subsequently studied by Beer et al. who demonstrated that there is high uptake of this compound in a variety of cancers including melanoma  and that uptake correlates with expression of the αvβ3 integrin measured using immunohistochemistry . The purpose of this study was to understand the relationship between perfusion assessed by [15O]H2O and 18F-fluciclatide kinetics in non-small cell lung cancer (NSCLC) and melanoma, where Phase 1 trials of humanized antibodies and peptides targeted to integrins have shown promise ,. These two tumor types have also been shown to have varying degrees of αvβ3 and αvβ5 expression on tumor cells relative to vascular endothelium with melanoma suggested to have expression on both tumor and vascular endothelium and NSCLC suggested to have expression predominantly on the vascular endothelium . The underlying hypothesis for the study was that fluciclatide retention in tumors is initially dependent on perfursion, but at later timepoints, retention is independent of perfusion. Patients were recruited from oncology clinics at the Imperial College NHS Healthcare trust and the Royal Marsden Hospital NHS Trust. The study was approved by the hospital Local Research Ethics Committee in accordance with the Helsinki Declaration revised guidelines (2008). The eligibility criteria were as follows: patients aged ≤80 years old with a histological proven NSCLC or melanoma, and one site of measureable disease of ≥2-cm diameter, with a treatment-free interval of 3 weeks (or 4 weeks for radiotherapy to the imaging site), life expectancy of at least 3 months, haemoglobin ≤10 g/dL, granulocyte count of ≥1.5 × 109, platelet count of ≥100 × 109, adequate hepatic function; exclusion criteria: pregnant or lactating patients, sexually active patients who are not employing adequate contraception. Additional details are provided in Table 1. NSCLC, non-small cell lung cancer. The chemical synthesis of the precursor of fluciclatide has previously been described , radiolabelling was performed at Hammersmith Imanet as previously described on an automated module (TRACERlab FX F-N; GE Healthcare). The specific activity and radiochemical purity of the injectate, determined by high-performance liquid chromatography (HPLC), was 320 GBq/μmol and 99.7 %, respectively. All patients were scanned on a PET-CT (GE-Discovery RX) scanner after being positioned such that the field of view (FOV) included the tumor volume of interest. The axial FOV of the scanner was 15.7 cm and the transaxial FOV was 70 cm. 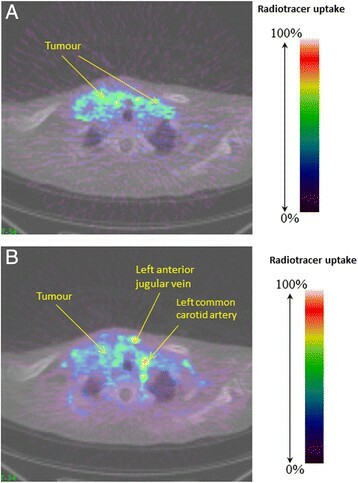 A low-dose CT scan (20 mA and 120 kV) was used for attenuation correction prior to the PET scan. A target dose of 600 MBq [15O]H2O was injected i.v. over 20 s followed by a 30-s flush with normal saline. Dynamic PET scanning was done for 8 min and 40 s with the following frame durations: 30 s × 1, 20 s × 1, 5 s × 22, 10 s × 3, 30 s × 5, and 60 s × 3. After a 2-min break to allow for radioactive decay (15O half-life = 2.04 min), the [18F]fluciclatide scan was performed. [18F]fluciclatide was administered by a bolus i.v. injection over 10 to 30 s. The PET acquisition was conducted as a single bed position dynamic scan (three-dimensional acquisition) centred on the tumor volume of interest (VOI) for 66.5 min. Data were binned into the following time frames: 10 s × 10, 20 s × 4, 30 s × 4, 60 s × 7, 120 s × 4, 300 s × 3, and 600 s × 3. Sinograms were Fourier-rebinned into two-dimensional slices and reconstructed (with correction for attenuation, scatter, and dead time) using filtered back-projection (ramp filter kernel full-width-at-half-maximum of 2.0 mm). The final images had 128 × 128 × 47 voxels of 2.62 × 2.62 × 2.42 mm3. In order to derive an input function, blood samples were taken during the [15O]H2O scan via a radial artery cannula continuously at a rate of 5 mL/min for the first 9 min 40 s; discrete samples were taken at 3, 6, and 8 min 40 s. Similarly, continuous arterial sampling (5 mL/min) was performed for 10 min during the [18F]fluciclatide scan; seven discrete samples (5 to 10 mL) were taken at 2.5, 5, 10, 15, 30, 45, 60 min. Metabolite analyses were performed on the 2.5-, 5-, 10-, 30-, and 60-min samples. The computation of [18F]fluciclatide parent fraction and input function was carried out as described in . Volumes-of-interest (VOIs) were manually defined around visible tumors from the [18F]fluciclatide summed images using the Analyze software (Version 7). The same VOIs were applied to the [15O]H2O scan to extract tumor time-activity curves (TACs) for both tracers. Tomasi G 2009,  with Δ i and λ indicating respectively the duration of the i th frame and the half-life of 15O. The delay between Ca(t) and CT(t) was modelled by shifting CT(t) of i seconds (i = 0,1, …, 30) and then retaining the value of the delay which gave rise to the smallest WRSS. A two-tissue reversible compartment model was used to model [18F]fluciclatide kinetics, consistent with our previous study . 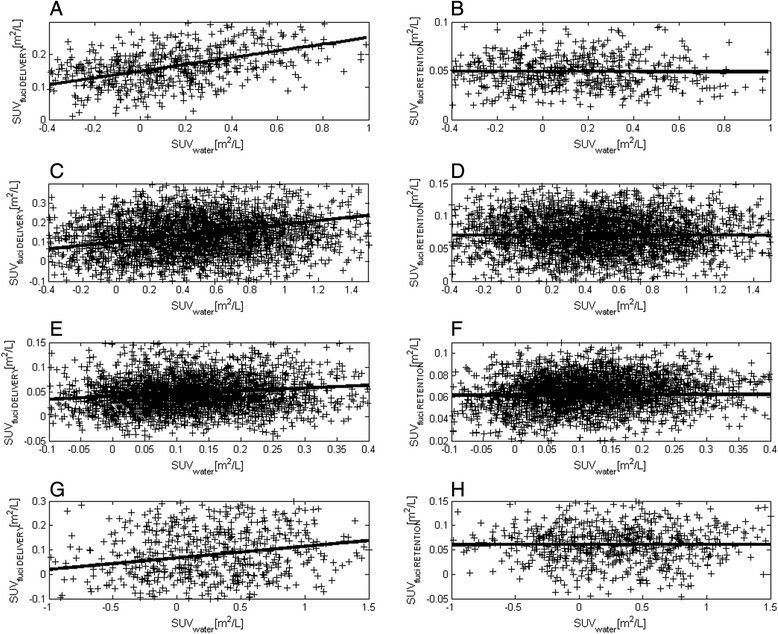 The metabolite-corrected measured arterial concentration of [18F]fluciclatide was used as input function for estimating with WNNLS the parameters K1 (mL/cm3/min), k2 (1/min), k3 (1/min), k4 (1/min), Vb (unitless) for each VOI. Weights were computed from Equation 3. The parameter k3/k4 ratio - a measure of the binding potential - was then computed for each VOI; as we previously reported , this parameter was the best of a number of parameters examined to differentiate between healthy and tumor VOIs. where the same upper limit used for SUVwater was employed. These parameters were computed for each voxel of the tumor VOIs and the agreement of SUVwater with SUVfluci RETENTION and SUVfluci DELIVERY was assessed using Spearman's correlation coefficient. The activity of injected [18F]fluciclatide ranged between 290 and 383 MBq, and that of [15O]H2O between 448 and 697 MBq. Due to tracer failure and patient comfort reasons, PET scans of both tracers were carried out in four patients; for two patients, only the [18F]fluciclatide data were obtained, and for the remaining patient, only the [15O]H2O data were obtained. Typical images of [15O]H2O and [18F]fluciclatide are shown in Figure 1A,B, respectively. The quality of the fits was good for both tracers. Examples are displayed in Figure 2A for [15O]H2O and Figure 2B for [18F]fluciclatide. In Table 2, the kinetic parameters for [15O]H2O and the k3/k4 ratios of [18F]fluciclatide at the VOI level are reported. For completeness, we also reported SUV parameters for [18F]fluciclatide. Summed images of (A) [ 15 O]H 2 O and (B) [ 18 F]fluciclatide. These were in a patient with non-small cell lung cancer with bilateral cervical lymph node metastases. The blood vessels are labelled. 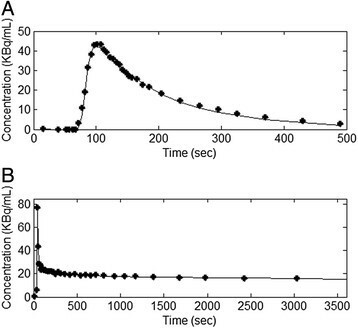 Time-activity curves for (A) [ 15 O]H 2 O and (B) [ 18 F]fluciclatide. The k3/k4 ratio of [18F]fluciclatide was 5.39 ± 1.46, in good agreement with our previous results in lung metastases (k3/k4 = 6.09 ± 3.04). There was a good correlation (Pearson r = 0.71, p value = 0.06, Figure 3) between SUVfluci RETENTION (x-axis) and k3/k4 (y-axis) at the VOI level supporting the use of the semi-quantitative parameter SUVfluci RETENTION as a measure of retention. Correlation between [ 18 F]fluciclatide retention SUV and k 3 / k 4 ratio. To investigate the relationship between perfusion and [18F]fluciclatide retention, which was not feasible at the VOI level due to the low number of subjects completing both scans, we compared SUVwater with SUVfluci RETENTION or SUVfluci DELIVERY at the voxel level. As expected, SUVwater was well correlated with SUVfluci DELIVERY, the correlation being statistically significant for voxels within all four tumors (p value <10−4 for all VOIs). The correlation between SUVwater and SUVfluci RETENTION, on the other hand, was not statistically significant (Spearman p value >0.15 for all tumors). This information is displayed in Figure 4, which shows the relationship between SUVwater (x-axis) and SUVfluci DELIVERY (y-axis, Figure 4A,C,E,G for patients 1, 2, 3, and 7, respectively) and between SUVwater and SUVfluci RETENTION (y-axis, Figure 4B,D,F,H). The plots on the same row correspond to the same patients and the continuous line is the fitted line of equation y = mx + q. Whereas a monotonic relationship can be noticed between SUVwater and SUVfluci DELIVERY, there is no clear visual relationship between SUVwater and SUVfluci RETENTION . Relationship between fluciclatide delivery and water SUV (A,C,E,G) and between SUV fluciclatide retention and SUV for water (B,D,F,H). 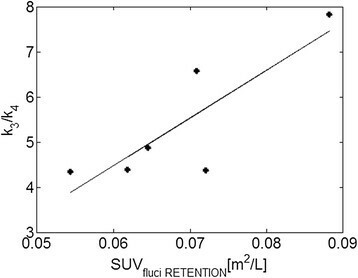 There was a lack of relationship between between SUV fluciclatide retention and SUV for water. There is an increasing need for effective biomarkers which can reliably predict the response to novel therapeutics acting as angiogenesis inhibitors or as vascular disrupting agents in vivo, and the RGD-based ligand, [18F]fluciclatide, is very promising in this respect. Given the haemodynamic context of angiogenesis, the uptake characteristics of a good biomarker should be independent of blood flow. Consequently, the objective of this study, which is of scientific relevance to the use of this and possibly other RGD-based ligands, was to assess the dependency of [18F]fluciclatide uptake on perfusion. The major finding of the study is that, at the voxel level, [18F]fluciclatide retention is not correlated with perfusion measured by [15O]H2O uptake. We contrast this finding with a good agreement, as expected, between [15O]H2O uptake and [18F]fluciclatide delivery suggesting that the lack of correlation between [15O]H2O uptake and [18F]fluciclatide retention was not due to noise. Incidentally, the two-tissue compartment model which we validated for [18F]fluciclatide in our previous report proved to be appropriate also for this dataset, and the mean k3/k4 ratio obtained in this study (5.39 ± 1.46) was in good agreement with the results obtained in lung metastases (k3/k4 = 6.09 ± 3.04). The main limit in this initial study is the small sample size, as only four out of seven patients successfully completed both scans, which hampered the quantification of the relationship between K1 of [15O]H2O and [18F]fluciclatide k3/k4 at the VOI level. In this regard our future plan is to test further these preliminary findings on a larger cohort of subjects and also to apply/develop appropriate noise-reduction approaches which will allow us to compare K1 maps of [15O]H2O and k3/k4 of [18F]fluciclatide at the voxel level. In conclusion, these preliminary results support the view that [18F]fluciclatide binding (retention) is not dependent on perfusion, highlighting the potential of this radiotracer in the study of receptors expressed on the neovasculature. The study supports the use of late imaging protocols (60 min post injection) for assessment of [18F]fluciclatide uptake. This study was funded by the MRC (programme grant MC_A652_5PY80), Experimental Cancer Medicine Centre grant C37/A7283, and an NIHR clinician scientist fellowship grant (LKenny 09/009) and supported by the NIHR Cancer Clinical Research Network UK. We wish to thank Kasia Kozlowski and Laura Maher, the radiographers and staff of Imanet and GE Healthcare for their assistance with this project. This study was supported by NIHR Cancer Clinical Research Network. LK contributed to the study design, data acquisition and analysis, manuscript writing and review. GT contributed to the data analysis, manuscript writing and review. CB, JL, MG and SM contributed to the study design and manuscript review. FT and EO contributed to the study design, manuscript writing, and critical review. All authors read and approved the final manuscript.